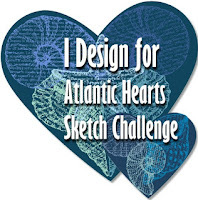 Check out this fabulous sketch from Atlantic Hearts Sketch Challenge!! I am so hooked on their sketches and having a blast playing along! Here's what I came up with, using the wonderful Petal Palette bundle from the Occasions catalog. I couldn't keep it black/gray and white, had to pop some color in there and why not make it my favorite Lemon Lime Twist!! Thanks for the great sketch AHSC!! !